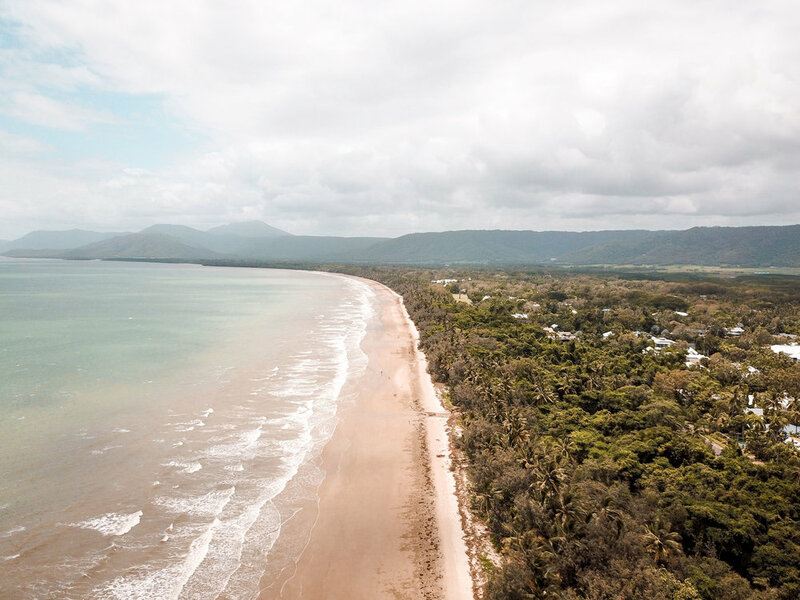 Having all met in Byron, we caught a flight to Proserpine where we stayed in an airbnb before jetting off on the Ocean Rafting adventure to the Whitsundays. If you’re staying in Cannonvale or Proserpine you can catch a bus into Airlie Beach (timings usually every 30 minutes). If you’re in travelling the East Coast, you have to make a trip to the Whitsundays. If the high speed Ocean Rafting boat isn’t enough, the crystal turquoise seas should do it. The day trip out is perfect if you’re on the road, you get to visit all the beautiful locations and have time to relax along the way. 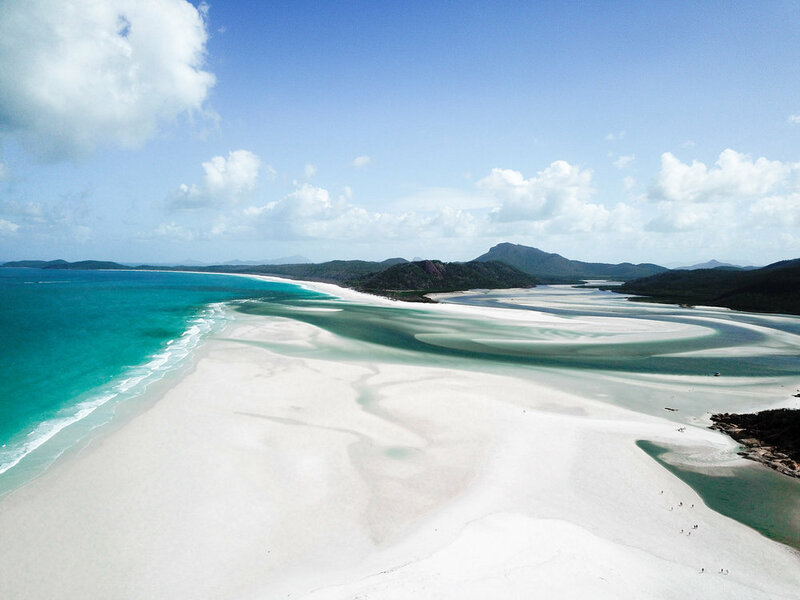 TIP: January is the wet month for the Whitsundays. However, we went in January and LOOK at the colour of the water. The weather was perfect. We picked up our Camper from Airlie Beach (link to all trip and camper bookings at the bottom!). From here we drove straight to Cedar Creek Falls, roughly 25 min drive! TIP: If you’re in a Campervan and you are picking it up from Airlie Beach - head to BCF (about 10 min drive North from Airlie Beach) to refuel gas canisters. After a dip in the fresh water we drove straight to Cape Hillsborough (1.5 hours). 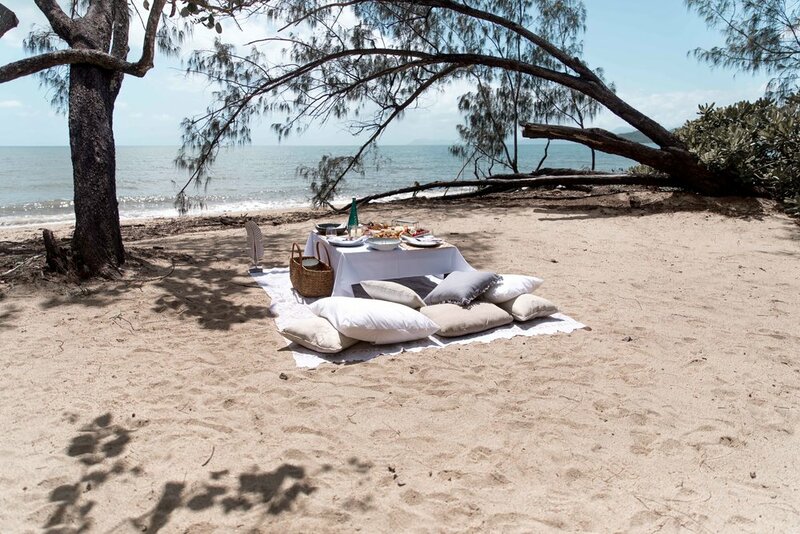 We camped the night at the Cape Hillsborough Nature Tourist Park - a campsite situated 2 meters from the beach. TIP: 60 Dollars for 4 people and a camper - bargain and well worth the stay! This morning was pretty special. We woke up around 4am to head to the beach for Sunrise. 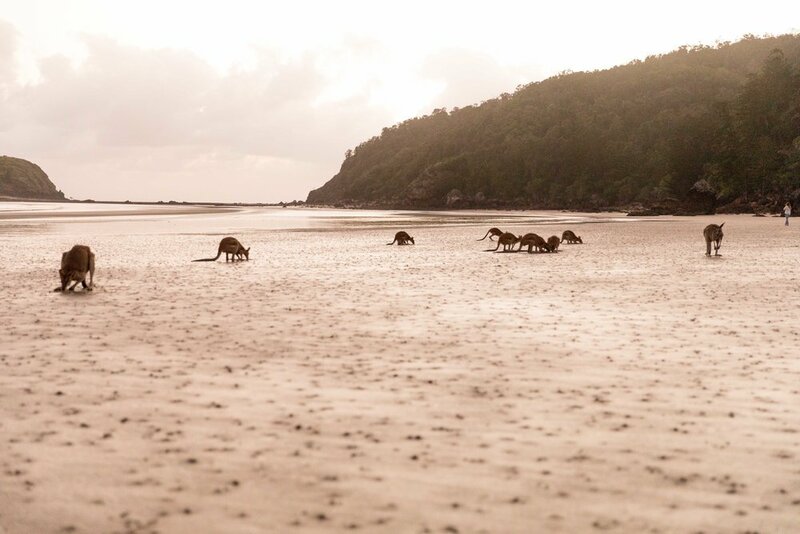 If you don’t know already, Cape Hillsborough is popular for the Kangaroos and Wallaby’s that visit the beach to fed every morning for sunrise. We then hopped in the camper and made our way to Agnes Waters (7 hours). We camped at The Workman’s camp (€9 per person per night). If you arrive later in the evening, you can find a plot to park up and stay and the Ranger comes round in the morning and collects card or cash. A perfect stopover place! Two minute drive from the campsite is a short walk called Paperbark Forest walk - it’s roughly 20 minutes and absolutely BEAUTIFUL. After a little walk we drove 3.5 hours to Rainbow Beach down Bruce Highway. Bruce Highway is the road you are pretty much on the whole roadie on this part of the East Coast and it really makes you see how vast and baron Aus can be! TIP: stop at Driver Revivers for free coffee or head to Bunderberg for great coffee and a lunch spot! We camped at Rainbow Beach holiday park ready for a day of exploring the next day. A great place to visit whilst you are here is Carlo blow Sand dunes - you can enter from Rainbow Beach town, follow the hill up and around and then take the steps up. When you get to the top of the steps, you turn left and follow to the woodland path round! We chose to get up fairly early today so we had enough time to explore Noosa. It’s about 1.45 hours from Rainbow Beach. Walk the Tanglewood Track in Noosa National Park (roughly 1 hour). The track takes you around the coastal path and you can head back to Noosa town from there. Make sure you stop off at the Fairy Pools! TIP: Check tide times to make sure you can swim in the Fairy Pools. Stayed in Noosa Caravan Park - a super peaceful campsite surrounded by Palm Trees. About 15 minutes out of town! Early rise for kayak on the everglades this morning! We hired from Boardwalk Boat Hire - €20 per person per hour - you can also get also get a double kayak or SUP. We then headed to Laguna Cove - it’s a beach just down from Noosa town - quieter and super peaceful! The main beach at Noosa can get pretty busy especially peak seasons so Laguna Cove is the perfect alternative. This morning we headed back to Laguna Cove for a chill and to grab some breakfast in the town! The Laguna Lookout is definitely worth a visit for sunset - you can drive up there or if you fancied a 30 min walk, its a lovely walk through part of the National Park. Don’t forget to look out for Koalas! Woke up early this morning to drive to the Glass House Mountains. 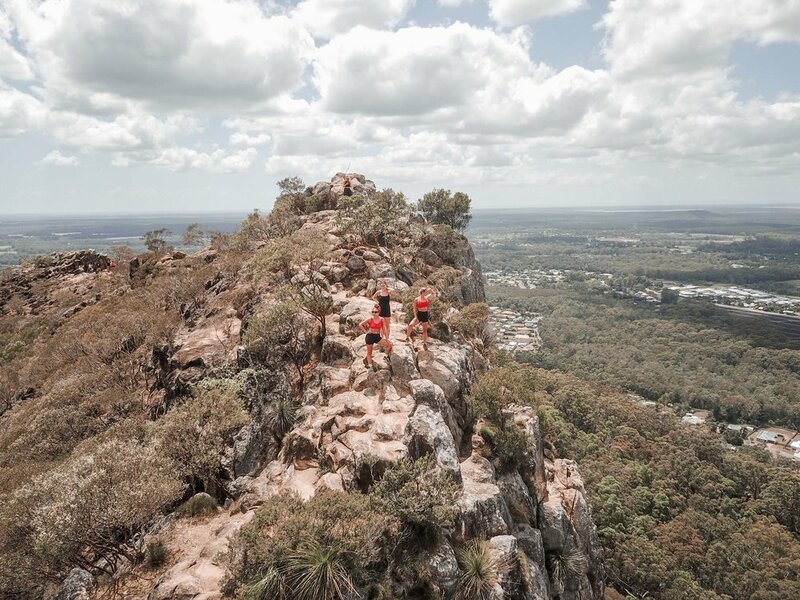 A great hike to do is the Mount Ngungun Trail - it’s about a 2 hour return trip to the top and is SO worth it. The views from the top are beautiful. After a nice morning wake up hike, we drove to Melany to have coffee and lunch at Sherpa Kitchen - a beautiful garden cafe with delicious food and insane coffee! A great waterfalls to visit nearby is Gardner Falls - it’s about 20 minutes from Mount Ngungun! We headed to Golden Beach Holiday Park which is a great place to stay if you want to see Bribie Island and the town of Caloundra. We arrived late afternoon/early evening and decided to have a little picnic on the beach! There’s several really beautiful beaches nearby to this campsite, one is Bulcock (around 35minute walk) and the other is Shelly Beach. Both are beautiful and have lots of cafes and markets to enjoy nearby. Late morning we decided to go kayaking over to Bribie Island - HIGHLY RECOMMEND. We rented our kayaks from Bill’s rental along the coastline just before Caloundra - they were super reasonably priced and you can hire single, double or even paddle boards. All my trips on the East Coast and our Campervan rental was booked through Sammy at RatPack Travel - the BEST rated travel agency in Australia, they offer 10% off every trip and rental, which makes it cheaper than booking direct! They create free personalised travel calendars and can give you SO much advice on where to stay and places to visit! If you’re anything like me, you can never say no to an adventure and an opportunity to explore another part of Australia you have never been too. We stayed in an airbnb for the 4 nights that we were there - you can find super reasonably priced ones in Cairns that’s really near the esplanade so it’s definitely worth checking out. One thing that Cairns is known for is Daintree Rainforest - the world’s oldest tropical rainforest, 80 Million Years older than the Amazon! So heading here was an absolute no-brainer. We woke up early to head to Central Station to catch the North Bus to Kuranda (30minute drive). Hopping off at Kuranda town, we grabbed a coffee and headed to the Skyrail ticket office to purchase a one-way ticket that takes you to Smithfield. (this is the town at the bottom of the cablecar, but a return option is available). Kuranda to Smithfield takes around 1.5 hours including the 3 stops you make. You can take longer at each stop as it’s a hop on/hop off service. There’s a great Ranger talk at Red Peak stop off that’s well worth doing! Another must-do when visiting Cairns is a trip to the Great Barrier Reef. We jumped on the Passions of Paradise boat trip (8 hour day trip). One of the big highlights for me was the Scuba Diving - the instructors on the boat were amazing and took their time to teach you all the things you needed to know to make the most out of your experience. Then when they felt like you were capable they let you take in the surroundings and dive unattached to the instructor. Later in the day, they gave the option of a second dive for 40 minutes! Cairns is also known for it’s party scene. Unfortunately, we went a little out of season but it was still worth while heading out! The Conservatory Bar, Woolshed and Gilligan’s are all great places to check out and dance the night away. TIP: We rented ours from A1 Rentals down Lake Street - super cheap and a great rental company! We rented the Wrangler for a few days so decided to head to Palm Cove, situated half way between Cairns and Port Douglas. (30 minute drive from Cairns). I had some work with a resort located on the beach so was lucky enough to spend the whole day there! There’s no shortage of beautiful restaurants in this area, most are beachfront and offer amazing dishes. We headed to Portofino, a super delicious Italian! I’d also recommend NuNu, it’s on the beach and the menu looked super tasty! I will have no hesitation visiting Cairns again, there’s enough to explore and keep you occupied for several weeks! I found accommodation and trips to be really reasonably priced and will definitely be back again soon! Planning for a photo shoot is the best way to make yourself and the client you are working with feel confident and comfortable. It’s so important to be clear on what your brief is before the shoot takes place, I have a few ways in which I do this. This is one of the main things I ask for when shooting with a brand or individual for the first time. Having visuals is the easiest and quickest way to quickly see someones vision of the images they are wanting you to achieve. That way you can see the style in which they are wanting to shoot and can always refer back to these before or during the photoshoot. This is a great place for you and the client to both share images and to have it in a folder than you can refer to before and during the photo shoot. It’s important for you to see the client’s visuals but also for the client to see yours. They need to know that you are on the same path, aesthetically. I create a board specifically for the client to see which will have all the images I think best suit what they are after, I give them access so that they can add images to it too. Give yourself enough time to edit and be happy with the images you are sending across to the client. There is nothing worse than rush-editing. You won’t be happy with the final result and nine times out of ten, neither will the client. Make sure you and the client is happy with the location of the photoshoot and check the weather beforehand! There is no point going ahead with a photoshoot in a beautiful outdoors location if a thunderstorm is predicted. If there is a deadline that the client needs to stick with, make sure you have a back up wet-weather option! Take into account timings of the location you have chosen - it may be that the location is going to be super busy at certain times of the day and it might be worth shooting at a different time. LIGHT! Make sure that the location and timings of your shoot work best with the light. It is such a big influence in the photoshoot and can really make or break an image. Be clear and check what time the light is going to be best at the location you are choosing. For example, in the images below - I wanted to photograph Tahila in the morning so that the light was low and we could create shadows with her body positioning. It’s really important to professionally send across the final edits. Clients won’t be happy if they have to wait a long time to download one photo at a time or if it requires various emails in order for them to receive their final images. Find a way that works for you but that is also professional, I mainly use WeTransfer Plus but Google Drive and Dropbox are other great programs to use. I hope these tips have helped when planning your next shoot! 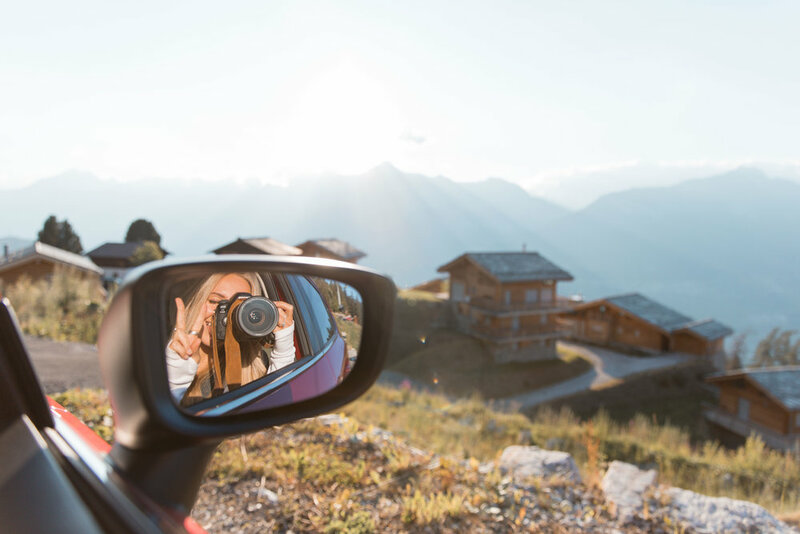 A roadtrip with your bestie from London through Switzerland to France? I think so. Me and Mols woke up fairly early to head to Dover for the 10am ferry. The ferry is the perfect way to get to France if you are travelling with a car as it’s super quick and if you book it in advance - fairly cheap! Once arriving in France we drove 6.5 hours to Belfort where we stayed in a super cute Chalet! I love arriving places in the dark as you never know what the view is going to look like in the morning. 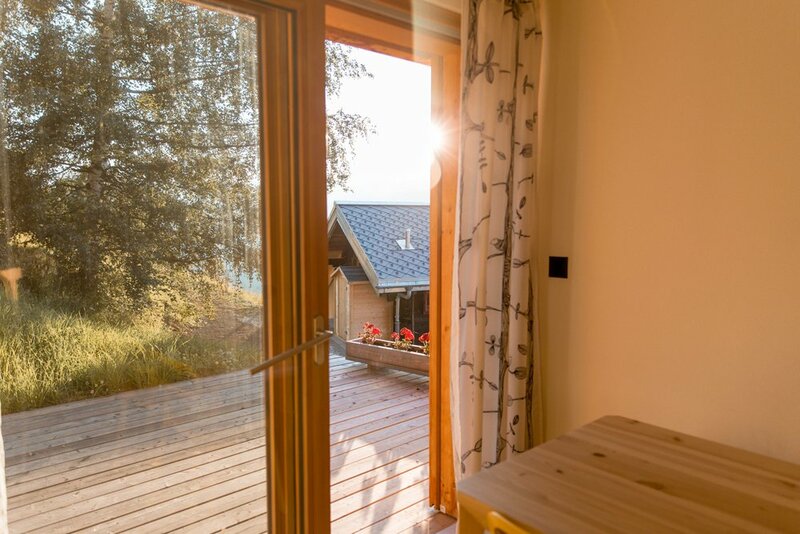 We weren’t disappointed, the chalet we were staying in had beautiful French shutters that opened out to stunning gardens and surroundings. 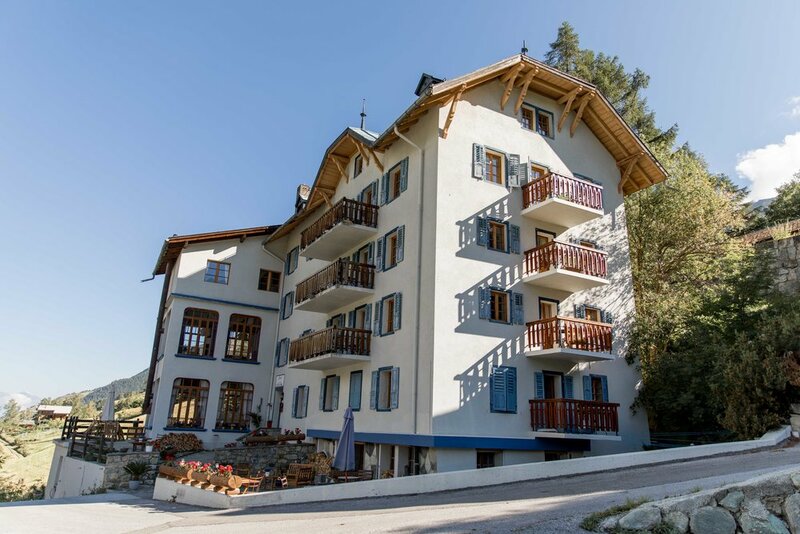 The chalet is family owned and run by a lovely lady who took total care of us - she makes a lovely French breakfast both mornings which of course included croissants! The morning we spent shooting and getting some work done before getting ready and heading to Eurockeenes. I hadn’t heard of the festival before but absolutely loved it! We watched Macklemore perform - if you’re a fan and haven’t yet seen him, GET YOURSELF TO A SHOW. He is a total performer and his energy is something else. It was pouring with rain and everyone was covered head to toe in mud yet, he still made 30,000 people dance for 2 hours straight. Incredible. After getting back around 4am we took the morning pretty slowly and planned where we wanted to go over another wonderful breakfast. My favourite part about road tripping is the not knowing where you’re going to go next and what you’re going to see. We decided to get on the road as soon as possible and head for the mountains. We drove around 4 hours into Switzerland and booked a last minute stay at a beautiful chalet in the town of Evolène. On route we stopped off on Lake Geneva and made a picnic as the sun was setting. This was the view we woke up to. The Chalet was so perfect - the view from our room opened up to the mountains and the whole valley. We decided to cook breakfast out the front of the hotel on the tables they had. After, we drove through Heremence to the town of Saint-Luc where we got a cable car up to Tignousa and decided to do the mountain top walk. The walk was amazing, the most incredible scenery and so many beautiful places to see along route. We walked for about 3 hours before heading back down the cable car and driving to Veysonnaz. This town was one of my favourite in Switzerland - we had to drive up the mountain for about 30 minutes before reaching our B&B we booked and oh my the views from the top were out of this world. We watched the sun set over the mountains opposite whilst we had dinner outside. I think I have found my dream house. After a tasty breakfast we headed for Nax - I had done a bit of research into the Via Ferratas that are nearby (Via Ferratas are climbing routes usually found on cliff walls - they have metal footings and wire that you attach yourself too and climb up). This was Mollie’s first time and she did great, it’s so lovely experiencing climbing Via Ferratas with different people, especially for their first time. The via Ferrata itself takes about 2 hours including a 30/40 minute walk back down the mountain to your car. It's a perfect one for anyone who hasn't done one before and it's actually the first one I have done where there were a few other people on route. Usually it's only you and whoever you are with! After the climb we drove 1.5 hours to Chamonix where we drove through the Swiss mountains and crossing the border into the French Alps, my favourite set of mountains in Europe. From the first time I went to Chamonix, I totally fell in love with it. The mountains, the town and the people. We stayed in my favourite campsite, Mer De Glace - situated just outside of Chamonix town, it sits within the valley and has all the facilities you could wish for! We even did a sunset Yoga amongst the trees. We decided to explore a bit of Chamonix town this morning and grab a coffee whilst we were there. Chamonix is one of my favourite places, the town sits within a valley of the beautiful French Alps and is truly breathtaking - incredible views in every direction. After having a little walk we drove to Geneva (roughly 1.10hour drive). We did the total opposite to camping this night and stayed in the most amazing 5* hotel on Lake Geneva called Hotel D’anglettere. BEAUTIFUL. 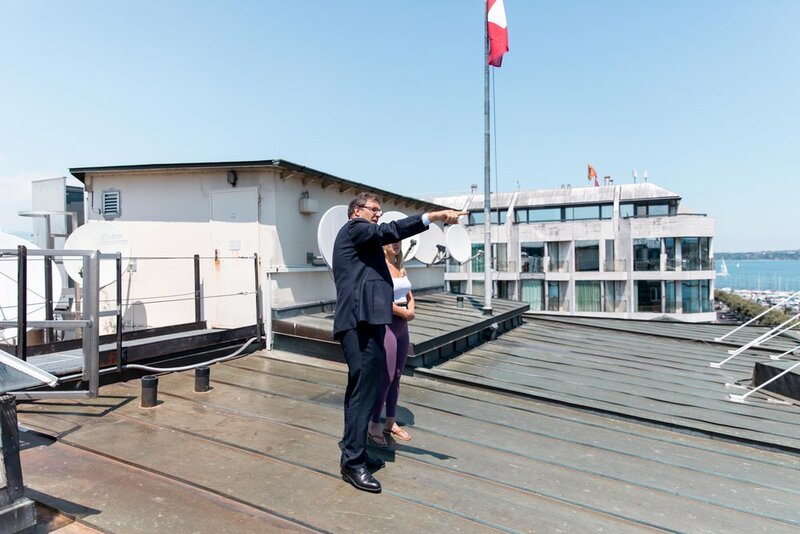 We got speaking to the manager and he took us up onto the roof of the hotel as he said this was the best possible view of Lake Geneva, he wasn’t wrong. Our bedroom was lovely and the window opened up to the lake and surrounding streets. We had a little walk around town before heading back to the hotel and having a 3 course dinner with wine tasting! After a perfect and well-needed nights sleep (thanks to the worlds comfiest beds!) we headed to the gym before having some breakfast in the hotel. The hotel restaurant is situated on the Lake front, so you can imagine how beautiful the view is. We drove 1 hour to Lake Annecy, and I was super excited to get there! I visited Annecy a few years ago on another road trip and totally fell in love with it. The colour of the Lake is insane, such a crystal blue colour and the town is just as stunning. We found a campsite called Au Coeur Du Lac, one of the cheaper campsites in the area that situated on the Lake. It had access to the public park where we had a swim and lounged around for a few hours. After we headed back to the campsite to set up and cook some dinner! We really wanted to explore Annecy a little more as both of us hadn’t spent that long actually taking it in and enjoying it the previous times we had been. We drove around the whole lake and stopped off at various spots along the way. Everywhere you look is beautiful scenery and places you could sit for hours on end. After stopping off in Annecy for lunch in a place called Dr Good Food - highly recommend for healthy and yummy lunches, we headed for Dijon. Dijon is a 3 hour North from Annecy - we chose to break up the drive back to Calais by stopping off in an Airbnb here. We managed to make it to the town centre in time for the England match. Our Airbnb was a perfect stopover place. Again, instead of driving straight to Calais, we chose to stop off in the lovely town of Epernay in the Champagne region, the drive from Dijon was about 3 hours. We had some lunch and did a bit of champagne tasting - couldn't resist! We also stocked up on some wine as its SUPER cheap here, I now see why people go here to by wine and champagne in bulk. After some lunch we headed to Calais which was a further 3 hours, definitely wasn’t as painful doing the drive in two halves! Calais is where we boarded the 1.5 hour ferry and drove the last two hours home. This road trip was honestly one of my favourites trips i’ve ever done. Creating new memories with my bestie and seeing the most incredible mountains and scenery. It’s made me think more about where i’d love to live when i’m older and I am definitely gravitating more and more to the mountains on a daily basis. Switzerland and France, I will see you soon. 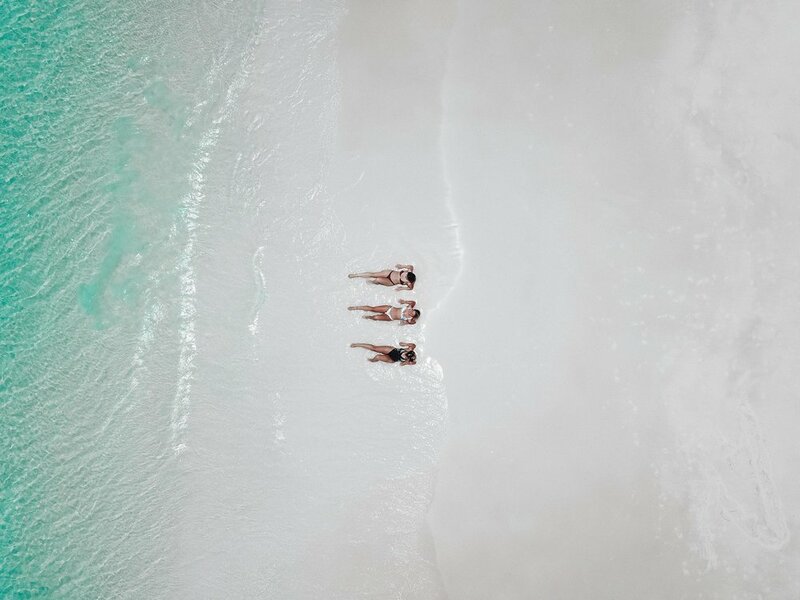 Sharing all things Photography, travel and lifestyle.